Emphatically define your message with our above template which contains a graphic of green arrow with word career written on it. Aesthetically designed to make a great first impression this template highlights the concept of career and business success. This image has been conceived to enable you to emphatically communicate your ideas in your Business PPT presentations on career building, improvement and advices. Create captivating presentations to deliver comparative and weighted arguments. Our PPT images are so perfectly designed that it reveals the very basis of our PPT template to make your clients understand. 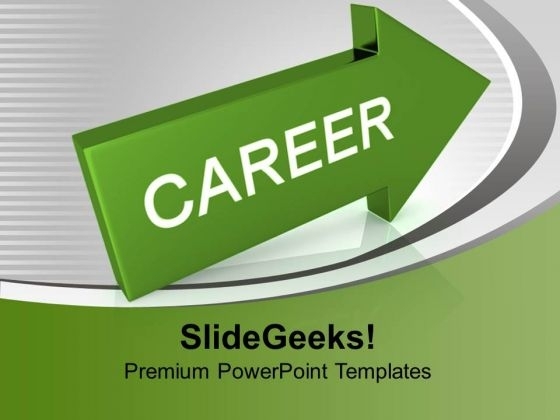 Our Arrow With Career Success PowerPoint Templates And PowerPoint Themes 1012 will ensure your ideas are noticed. You will be glad you tried us out. Energise your thoughts to fever pitch. Get them bubbling over with our Arrow With Career Success PowerPoint Templates And PowerPoint Themes 1012.